Recently, we have released a major update of Roadmap Planner. This means that sought-after features, like Milestones, Completion Status, and Effective Space Only, are finally available for you. Now it becomes much easier to focus on your current works, and track the progress of all your projects at once. Keep reading, and learn more on how each feature can improve the overall planning process. Any plan, whether it is personal, educational, or business, usually contains some important points that may stand for a meeting, examination period, release or update of a product, or a significant international conference that can influence your further steps in the market. These events serve you as checkpoints to see the volume of required works at each stage to correctly plan out time and allocate resources. With our new Milestones feature, you are able to mark such dates right on your roadmap. This is a great opportunity to highlight all key steps on your path to your final goal, and concentrate all your efforts to meet deadlines and reach success. To get the winning results and successfully get to your objectives, you should clearly understand the whole picture of your strategic plan, including how much work has already been done, and what is still left to do. With our productivity app, you are able to easily visualize not only your milestones, tasks and dependencies between them, but the status of each work as well. If your timeline is overwhelmed with completed items and blank spaces, most likely this will distract you from current works and milestones. As a result, it will be difficult to accurately manage your projects, and you may miss deadlines. We have a perfect solution for you to avoid this mess and its impacts. Simply choose the Hide Completed button and tag Effective space only. That’s it! Now you can focus only on the relevant tasks. We are constantly working to make your planning experience more convenient, and your workflow more productive. With a new version of Roadmap Planner, you will seamlessly schedule your timeline, properly evaluate your resources, and view the progress of each task in one document. 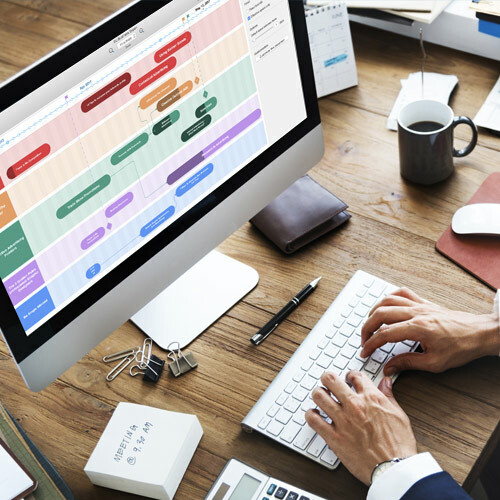 This smart technological tool will keep each of your projects simple and focused, and help to maintain them within the context of your strategic vision. Download Roadmap Planner today, and make the project planning process a favorite part of your work.